Charlotte, NC (May 9, 2017): Custom Classics by David Weekley Homes, the luxury home building division of David Weekley Homes, has two move-in ready homes available in the Myers Park community of Melody Woods in south Charlotte. The Parkhurst II, at 1425 Melody Woods Court, is a two-story home featuring four bedrooms, three full baths, one half bath and two-car garage. The gourmet kitchen offers professional-grade, stainless-steel appliances and an oversized granite island with sink. Priced at $1,299,000, this 4,000-square-foot home includes an oval soaking bathtub, heated flooring and spa shower in the owner’s bath. Located at 1414 Melody Woods Court, The Brackett offers four bedrooms, four full baths and a two-car garage. A fully-appointed kitchen leads to a covered outdoor living area featuring a flagstone patio and outdoor fireplace overlooking the wooded rear yard. This 4,200-square-foot home has wood floors throughout the first level and is priced at $1,315,025. Melody Woods – Myers Park is in walking distance to Freedom Park, featuring 98 acres of walking and biking trails, athletic fields, tennis and volleyball courts, playgrounds and a historic steam engine display. The community is also convenient to Park Road Shopping Center, SouthPark Mall, Dilworth and Uptown Charlotte. Students attend Charlotte-Mecklenburg Schools, including Dilworth Elementary, Alexander Graham Middle and Myers Park High schools. All of David Weekley’s homes in the Charlotte area are built to the Environments For Living® Program’s Gold Level standards, and are backed by a heating and cooling energy usage guarantee. Under the Environments For Living program, these EnergySaverTM homes are constructed using the latest principles of building science, meaning each home offers energy efficiency, indoor environmental quality and durability benefits. 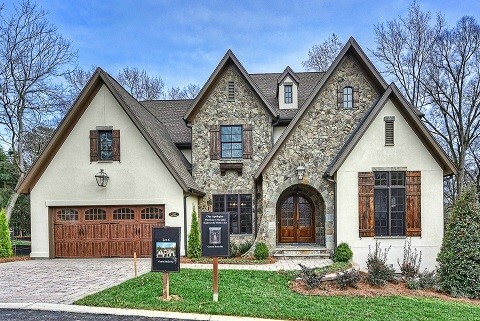 For more information about David Weekley Homes in Melody Woods – Myers Park, call 704-277-2958. Melody Woods1: The Parkhurst II in Melody Woods – Myers Park is ready for move-in.